What is music entrepreneurship? Should musicians see themselves as small business owners? Is it more empowering to think of yourself in this way? In this episode of The New Music Industry Podcast, I read an excerpt from my new book, The Essential Guide to Music Entrepreneurship. David Andrew Wiebe here. 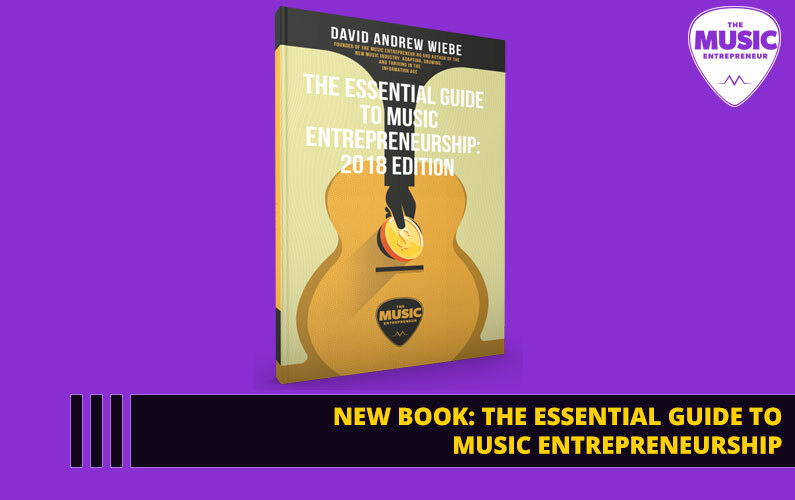 I’m not sure if you knew this but I recently released a brand-new book on April 1 called The Essential Guide to Music Entrepreneurship: 2018 Edition. The reason I quietly released this new book is because it is a shorter work compared to The New Music Industry. So, you can go to MusicEntrepreneurHQ.com/musicpreneur to learn more about this work. In today’s episode, I’m going to read the introduction, so you can get a feel for it. If it’s something that you want to pick up, you can go to the link I just mentioned. So, here’s a little excerpt from the book. I hope you enjoy it. Increasingly, the term “music entrepreneurship” is coming into more common use. An introduction to what music entrepreneurship is. The skill set you need to develop as a music entrepreneur. How to work with others. How to present yourself – etiquette and professionalism. Auditions, competitions, and festivals work. Setting up a private studio. As I look at this list of topics, I can’t help but feel puzzled. Some of them are sensible, and even important subjects to cover. But I feel that curriculum developers are a bit confused. Some seem to equate business with having a job. Sorry, what? I thought we were talking about entrepreneurship! Some schools are even covering topics like “social media in the digital age”, which I don’t even understand. Did we have social media, as we know it today, before the digital age? Fax machines, maybe, but social media? I don’t think so. But most experts, course developers, and professors seem to agree – “music entrepreneurship” means many things to many people, and on this point, I concur. In case you don’t know, I’ve been running a site called The Music Entrepreneur HQ – a site that has its roots in a podcast I first launched in 2009, simply called David Andrew Wiebe Podcast (today, I have a podcast called The New Music Industry Podcast). More to the point, I’ve been exploring the connection between music and business since 2011. As I thought about that, I realized how disconnected he was from my vision. I have never wanted to develop a university-like system with my resources – especially looking at what’s being taught in most music entrepreneurship courses. I’ve always wanted to create better information and facilitate independent thinking in the process. I believe that music entrepreneurship is a movement toward innovation, not away from it! There are many exciting developments in the music industry, unlike anything we’ve ever seen in the past, driven by technological advancements, and most notably, the internet. So, why do we feel the need to hold so tightly to the past? I don’t believe any introductory music entrepreneurship module should consist of learning how to write a résumé (this one has me scratching my head), what to wear and how to conduct yourself, or developing a repertoire for that matter. Before anything else, you should be given the opportunity to learn what music entrepreneurship is, why it matters, and why you would even want to pursue it in the first place. I am not under the impression that you don’t know what “music entrepreneurship” means. I’m certain that images of tech startups, music streaming apps, bootstrapped businesses, venture capitalists, and other “isms” are all flooding your mind already. I wrote this guide because I think it’s important to cover the basics. An entrepreneur is a self-starter, someone who aims to solve other people’s problems, someone who builds assets they can live on. And this is the vital part that appears to be missing from many existing courses. So, whether you’re looking to treat your music career like a business, start a new business venture in the music industry, invest in a company, or acquire an existing entity, I wanted to offer a simple, straightforward guide to music entrepreneurship that covers the key elements you need to know. We’re all strapped for time – that’s why I’ve kept this guide short. It won’t necessarily tell you “how” to get your business off the ground, but it should answer “why”, and give you enough of a foundation to stand on to make your passion your life. My hope is that you will learn, be inspired and entertained, and apply the principles within to better your career.